Iron availability affects swarming and biofilm formation in various bacterial species. 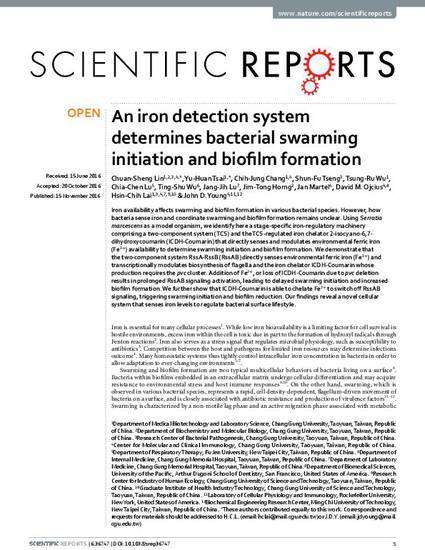 However, how bacteria sense iron and coordinate swarming and biofilm formation remains unclear. Using Serratia marcescens as a model organism, we identify here a stage-specific iron-regulatory machinery comprising a two-component system (TCS) and the TCS-regulated iron chelator 2-isocyano-6,7-dihydroxycoumarin (ICDH-Coumarin) that directly senses and modulates environmental ferric iron (Fe3+) availability to determine swarming initiation and biofilm formation. We demonstrate that the two-component system RssA-RssB (RssAB) directly senses environmental ferric iron (Fe3+) and transcriptionally modulates biosynthesis of flagella and the iron chelator ICDH-Coumarin whose production requires the pvc cluster. Addition of Fe3+, or loss of ICDH-Coumarin due to pvc deletion results in prolonged RssAB signaling activation, leading to delayed swarming initiation and increased biofilm formation. We further show that ICDH-Coumarin is able to chelate Fe3+ to switch off RssAB signaling, triggering swarming initiation and biofilm reduction. Our findings reveal a novel cellular system that senses iron levels to regulate bacterial surface lifestyle.